Adult male southern house spiders are leggy and fast unlike their younger selves and the females that stay put in their silken lairs. Males give up feeding almost entirely and instead devote all their energy to prowling the building for receptive females. Males have long and prominent pedipalps at the head. As the family name suggests these spiders inhabit crevices in buildings or cliff faces and construct silk webbing extending on the surface around their hiding spot. The females are esentially black in color where as males are lighter brown. Once mature the males abandon their webs and roam about in search of females. Their appearance suggests something dangerous like a recluse spider, but in fact these spiders are esentially harmless to humans. They are very common, especially around older buildings in both Phoenix and Tucson areas. 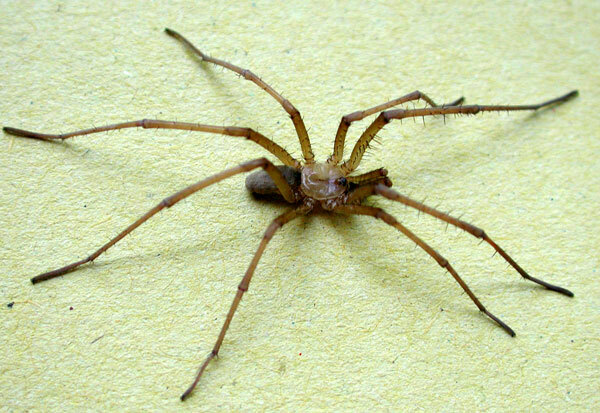 Originally an old world species, the Southern House Spider has been distributed to warm climates the World over.